As I promised you, my blogging has taken a back seat to the reality of moving from a large house in LA to a slightly smaller home in Los Altos. At long last, I feel almost stable. Moving to a new city is a traumatic experience. I haven’t called anyone or spoken with anyone except Daniel, Matias and Jenny for the past few weeks, and a rather large and new circle of friends that I have met over the years who have been Daniel’s colleagues at Helio, Palm or Google. I haven’t called my closest friends or family. It wasn’t that I didn’t want to speak with them, it’s that I have been obsessed with unpacking. All I have done for the past two weeks is unpack stuff. We threw or gave away stuff when we left and are tossing and donating even more on this side. How did we get so much stuff? Well, both sets of our parents have passed down a huge amount of stuff to us, and in that we had so much storage space, we accepted it. But after having to move and unpack it all, I know we will be less generous in taking stuff from friends and family, here and no longer here. Not one thing was broken in the move. Bravo to the movers and all the friends who helped us pack. The movers were amazing in their speed and focus in getting stuff packed and in the van. They inspired me to become the incredible hulk, and lift heavy boxes with nary a flinch. Somedays I overdid it a bit, but by and large the whole process was great exercise on many levels. I have enjoyed seeing people of all ages and ethnicities here. The one age group I am not seeing is college students, and after 30 years of seeing mostly college students, it’s a wonderful change. We had an open house this weekend and managed to get most of the boxes put away just before the party started. I sat down in the backyard to rest before people started arriving, when all of a sudden I was surrounded by 7 boys and girls between 3 and 5. Holy moly. They decided I was cool and befriended me. I taught the boys how to throw the ball for Giaco. I put out a big blue blanket for the girls. Katie and Ella went into some fantasy world, and when I checked back in 20 minutes later, Katy was processing as if in a coronation with the blue blanket over her shoulders and flowing behind her. At her side were two boys processing with her. What a scene! I am orchestrating “Sunset Time” for Kenny Burrell’s 80th birthday celebration at Royce Hall. In my dreams, I fancy imitating Vince Mendoza’s terrific arrangements of Joni Mitchell songs. We’ll see. As jazz so often takes classical tunes and “jazzes” them up, I’m going to take Kenny’s already jazzy tune and un-jazz it a bit. Although I’m insanely horny to get back to work on the opera, this will prove to be a fun interlude. All of this moving from hotel to hotel to new house has kept our dogs puzzled and a bit unsettled. One thing I learned during this transitions, is that things don’t matter to dogs: only people do. This little revelation seemed to transcend itself. The dogs love our new place; they get to play wild hunter/explorer and there is lots of grass for playing fetch. The parrots are slowly warming to the place. We are feeling like we finally have a new home. It is so quiet here. Having come from a place three houses up from a bustling Hollywood Blvd complete with sirens, noisy vehicles, booming music from passing cars, and helicopters (ah, home sweet home), it’s quite a contrast. I have joined G+ and love it. I prefer the flexibility it affords. Facebook seems a bit like the old AOL, where you have to stay inside its universe. I would like to figure out what the difference between my making G+ post public, and blogging on this blog. WordPress certainly has more options and power than G+ at this point, but the difference will likely become minimal later. 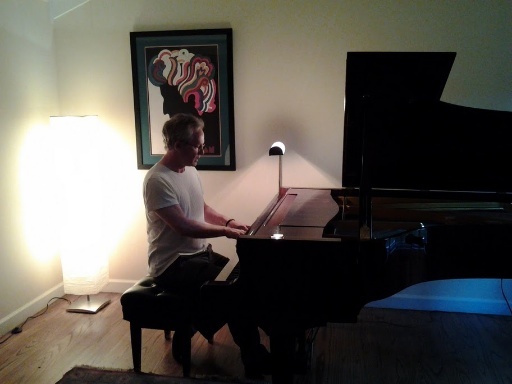 The picture above is of me playing our Feurich grand piano in front of a new poster of Bob Dylan signed by Milton Glaser, gifted us by Wes and Cicely as a moving-in present. It fits beautifully with the fun lamp that glows in the corner. I was playing “Like a Rolling Stone” here. Just an update to let you know that all is well. Next post: What is the beguine rhythm?